Loaded with the protein-packed meat ingredients (80%) that Mother Nature evolved your dog to eat, ORIJEN’s award-winning low-glycemic formula reduces unwanted carbohydrates and supports healthy blood sugar levels to promote peak health and body conditioning. We believe that pet lovers want to know where their pet's food comes from. So we focus on local ingredients raised by people we trust, and delivered to our kitchens fresh each day. That’s why we focus on ingredients that are sustainably raised within our region by people we know and trust, approved ”fit for human consumption,” and then delivered to our kitchens authentically fresh each day. 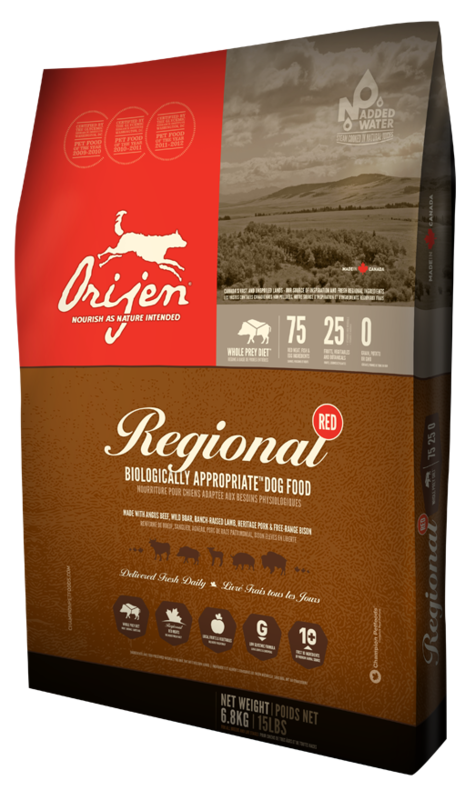 No other dog food can match Orijen's fresh local ingredients. Boneless Angus beef, boneless wild boar, boneless lamb, beef liver, boneless pork, pork liver, whole herring, lamb liver, beef meal, lamb meal, herring meal, salmon meal, Pollock meal, beef tripe, bison, lamb fat, whole egg, red lentils, chickpeas, green peas, yellow peas, green lentils, herring oil, pea fibre, yams, sun-cured alfalfa, pumpkin, butternut squash, spinach greens, carrots, Red Delicious apples, Bartlett pears, cranberries, blueberries, kelp, licorice root, angelica root, fenugreek, marigold flowers, sweet fennel, peppermint leaf, chamomile, dandelion, summer savory, rosemary, Enterococcus faecium. SUPPLEMENTS Vitamin A supplement, vitamin D3 supplement, vitamin E Supplement, zinc proteinate, dried Enterococcus faecium fermentation product.